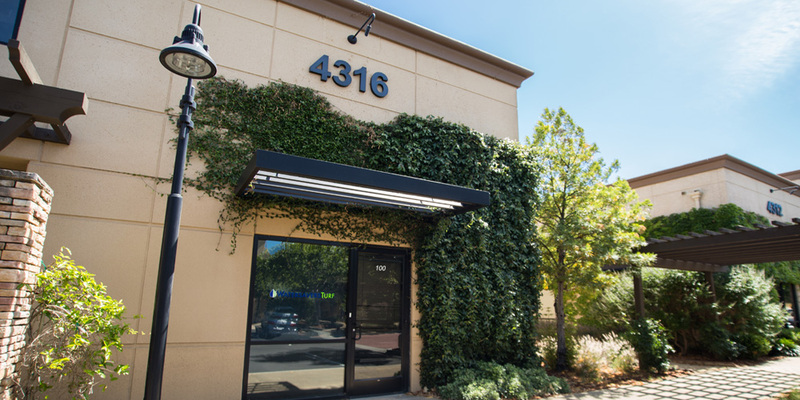 Stop by the Watersavers Turf artificial grass showroom at 4316 Redwood Highway, Suite 100, San Rafael, in Marin County, CA to meet our expert staff, and see our top-quality products in person. You’ll find a wide variety of turf for home and commercial use. In our beautiful, fully-stocked San Rafael showroom or in any of our other six locations, you can enjoy your shopping experience. You’ll find everything you need for synthetic turf installation in our one-stop shop, with friendly and knowledgeable pros to help you at every step of the way. Our product looks great, is easy to care for, can last for decades, and saves natural resources. What are you waiting for? When you visit our artificial grass showroom in Marin County, you can see and touch our turf making it easy to picture a new eco-smart yard for your home or business. At our artificial grass showroom in San Rafael, our knowledgeable staff has answers to your questions. We can give you free 1’ x 1’ samples of many of our sixty plus types of realistic fake lawn. Our live grass substitutes come in a range of face weights from economy grass to luxury lawns. Any price point is the right price point when you can boost your yard while you help save the planet. We carry niche grass styles like pet turf and pro-caliber sports field, along with all the tools you’ll need to do your installation and make your landscape vision into a real yard you can see and feel. Spend some time in our artificial grass showroom in San Rafael and find out just what synthetic turf can do. We show a large range of our grasses in our roomy display area, so you’ll be able to picture what the fake lawn will look like when it’s in place as part of your project. An eco-smart design will save water by the gallon, but a good one will also please the eye. With a lawn where folks will sit or play, you have to think about the quality of touch as well as the visual pop of a material. To check out the look and feel of the newest designs of synthetic turf, there’s no better place than our showroom. Come get to know our product with your own eyes. In 2016, this drought-friendly material is a trend for top landscape designers and celebrities around the world. You’ll believe it when you see it. We’re a one-stop shop for what you’ll need at every step of your lawn replacement process. We carry high-quality infills and pads for your faux grass, and the best tools in the industry to get the job done, like the Easy Seam machine which you can rent or buy. Our select turf accessories give you the best in the field, from practical nails to fun golf flags. We can give you a lawn you love, the goods and tools to put it in place, and we’ll even help you find the company to do the job. If you’re a contractor, we can even train you how to do a turf install with a free class. Come talk with us about what you need. We’re open 6 days a week. If you can’t visit the showroom in person, give us a call. The ongoing CA drought has hit towns and cities across the state hard. In the City of San Rafael, folks are doing their part to help. The Governor has set a goal for all areas of CA to lower their water usage and use 20% less water than they did in 2013. The Marin Municipal Water District shows local stats near that goal as we all chip in with new habits and lifestyle changes. Short showers, low-flow toilets, and smaller gardens are now a part of daily life as Marin adjusts to the new rules. The MMWD has even banned irrigation during the day. Nobody can water plants or lawns between the hours of 9 am and 7 pm. The MMWD took a stand and has put a stop to the irrigation of ornamental plants or lawns on more than three days per week. Nobody can use a hose that does not have a shut-off nozzle to stop leaks and drips. These are great steps towards lower water usage in yards, but why water at all? With fake grass, you don’t need to water, mow, or re-seed your lawn to enjoy a soft carpet of green. You can help the City of San Rafael save water if you switch your live lawn to synthetic turf. Once you make this eco-smart change, you can save almost fifty-five gallons of water per square foot per year! No wonder yards in and around Marin are going green with faux grass. Come by and see what our showroom has to offer, and make a drought-friendly choice for your landscape. Visit us at 4316 Redwood Hwy. Ste. 100 in San Rafael, give us a call at (415) 870-9503, or stop by any of our CA stores.